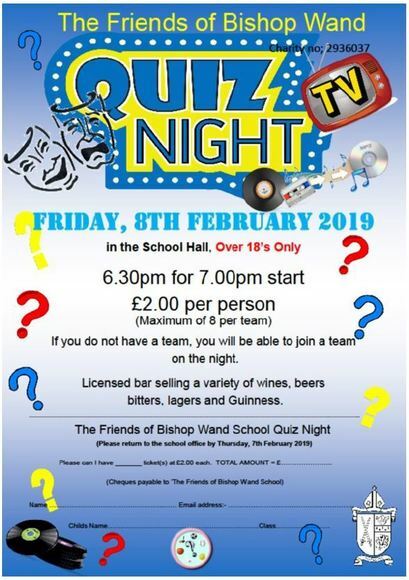 The Friends of Bishop Wand would like to invite you to our annual Quiz Night on Friday 8th February. It’s a great opportunity for ‘an after Christmas night out’ with family and friends and various members of the Bishop Wand community, plus the chance to test your knowledge and win a bottle of wine for everyone in your team. Places can be booked/purchased from the school office in advance or, on the door. Doors open at 6.30pm for a 7pm start. Teams are a maximum of eight people, but don’t worry if you haven’t organised a team, as you can join one on the night. Also, there will be our traditional raffle with many prizes; a small prize for ‘Best Team Name’ and a cash prize for the popular ‘Heads and Tails’ game. Our licenced bar will be in the new Canteen area this year, stocked with a variety of beers/lager/cider and soft drinks. Please bring your own nibbles but not drink! This is a very enjoyable evening and great fundraiser for our school, so please do try and come if you can, we look forward to seeing you!